This week is mental health week in the UK and last week $7,272,134.95 was raised during Bell Let’s Talk Day in Canada. 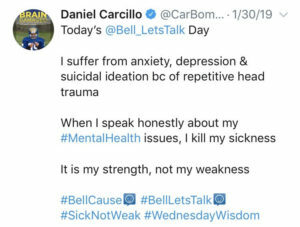 For those who are not familiar with Let’s Talk, it is a day during which Bell Canada seeks to cultivate awareness by stimulating conversations about mental health and eliminating the stigma of mental illness. 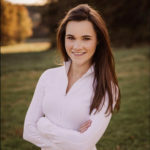 Athletes, politicians, and others took to social media platforms on January 30th where they shared their thoughts, personal experiences, and encouragement. With each social media interaction 5 cents was donated toward mental health initiatives in Canada. We are one week out from a day when you could not avoid seeing comments about mental health. Now that we are back in our routine, in your day to day life, what has changed? What are you doing differently to combat stigma? Some of you may be scratching your head wondering what that question is supposed to mean. It’s a fantastic initiative but it is up to us as individuals to harness the momentum and do things differently in our everyday lives because that is what truly makes the difference and that is how stigma is reduced. If we call attention to mental health on one day but in or everyday lives we change nothing then we have failed to recognize and embrace the intent behind mental health initiatives. Stigma lives in our everyday lives, that is where it thrives, and that is where our influence over it is the greatest. Standing near the tunnel at the first Islanders game with my young son I heard another Islander fan scream “hope he doesn’t want to kill himself tonight.” My heart sunk, stomach turned, and I had a knot in my throat. 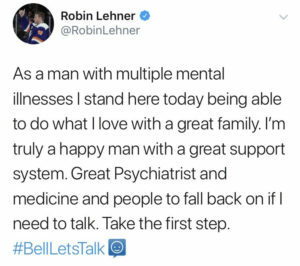 The comment was directed toward Robin Lehner who bravely and beautifully discussed his struggle with mental health prior to the start of the season. I took a deep breath trying to decide how to proceed, silence was not an option but my response took longer than usual as options ran through my mind like rockets. Just as I was about to comment, another Islander fan chimed in, his exact words escape me but he started cheering for Lehner, loudly, screaming “you are an inspiration.” I am usually the one to respond to things like this, in fact, I have always been the lone voice, but as I joined in cheering with this other fan the realization that the tide was turning couldn’t have been more invigorating. This was being the change, this was understanding and embracing a movement, this was a community snuffing out stigma and carelessness. Fact: Stigma can happen without your awareness. Our brains sometimes rapidly perceive others as similar or different than us. When we perceive others as different sometimes we may distance ourselves. Do it differently: Pay attention, look for similarities between you and those around you even those you feel are different, and see the person first. Fact: What we say matters. Imagine you are a person experiencing a difficult time, you haven’t shared this difficult time with anyone then someone you are close to makes a joke about the exact situation you are dealing with, making fun of it or making light of it maybe in a joking way. How likely would you be to tell that person about your struggles? Fact: Bullying is linked to mental health difficulties, STOP IT! Do it differently: If you notice bullying in the locker room, in class, or in the workplace, stop it and support those who need it. Bearing witness to bullying and doing nothing does not make you innocent. Parents, hold your children accountable for their words and actions. Watch your own words, children hear you and mimic you. Fact: When we talk about mental health most get it wrong. There are many times you read about a person experiencing mental health difficulties and the journalist states something like “the bipolar man” or “the schizophrenic.” This defines the individual by the illness. Do it differently: Use person centered language like “my friend who has bipolar disorder” or “my friend who is suffering from depression.” By doing this you are putting the person first, because people are not defined by illness. Think about how you describe someone who has cancer “my friend who has cancer.” Speak about mental health the same way. Fact: Stop waiting, reach out yourself. Sometimes people experiencing mental illness or difficulties with substances feel like they can’t reach out or for other reasons don’t reach out. Depression specifically speaks the language of isolation. Do it differently: You know that person in your life you haven’t heard from in a while? Call, go visit, send a text. Think about the person in your life who you know experiences mental illness, reach out. Make the first move. Also, make second and the third move if you have to. So, what are you going to do differently? Use the #DoingItDifferent and commit to making a change in your everyday life to reduce the stigma of mental illness and truly be an influencer!